Blacks Have High Crime Rates, What About Hispanics? “Demography is destiny, and the Latino demographic indicates that Hispanics will be filling up the prisons and committing the lion’s share crime in this country for decades and decades to come. 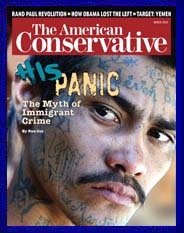 This entry was posted in Immigration/Race and tagged American Conservative, Hispanic Crime, Immigration/Race. Bookmark the permalink.